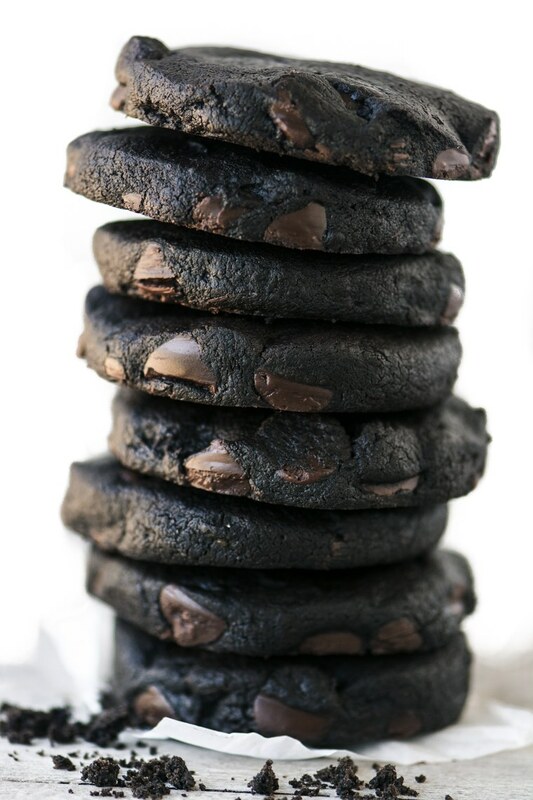 If you love chocolate, you're going to flip for these easy Double Dark Chocolate Chip Shortbread Cookies --- this is the best slice and bake cookie ever! Cream the butter, cocoa powder and sugar together until completely combined and smooth. Add in the vanilla. if using a stand mixer, be sure to scrape down the sides of the bowl. Mix in the flour, making sure to get it thoroughly blended, but don't over mix. Fold in the chocolate chips and turn the dough out onto a board dusted with cocoa powder. The dough will be sticky. For roll and cut cookies, form into an 8 inch disk (like you would do for pie dough.) Wrap in plastic and refrigerate for at least 3 hours or until firm enough to roll out. You can also freeze the dough for later use. Roll the disk out to 1/3 inch thickness and cut cookies with a 2 1/2 inch round cookie cutter. Use cocoa powder liberally to prevent sticking to the surface and to your rolling pin. Place the cookies on a parchment lined baking sheet and bake for 12-15 minutes. The cookies will still be soft, but will firm up as they cool. Cool them on the baking sheet for 10 minutes, then carefully transfer them to a cooling rack. For slice and bake cookies, form a 10" log. Wrap in plastic wrap, smoothing the dough as you wrap it, and twist the ends to secure. Refrigerate for at least 3 hours until firm enough to slice. You can also freeze the dough for later use. Slice the log into 1/3" slices with a sharp knife. If some of the chips fall out of place, or the dough crumbles as you slice, reform it with your hands. Place the cookies on a parchment lined baking sheet and bake for 12-15 minutes. The cookies will still be soft, but will firm up as they cool. Cool them on the baking sheet for 10 minutes, then carefully transfer them to a cooling rack. Note: Because of the chocolate chips these cookies will not be perfectly uniform or smooth.